"Imagine an M-60 for Jesus!" Although Trey Parker and Matt Stone have resisted making another South Park movie, that doesn't mean that they've forsaken a somewhat more ambitious approach to the adventures of their foul-mouthed cartoon children. This disc collects the three episodes that form a trilogy called Imaginationland, which was long in gestation and features some taut writing, bizarre scenarios, and even more socially unacceptable humor than usual. As a result, it has become an immediate fan favorite. There are two main threads to the story. One involves a bet that Kyle (Stone) makes with Eric Cartman (Parker) regarding the existence of leprechauns, with the wager being a lewd oral action. The boys meet up with a leprechaun, who is determined to get to Imaginationland to warn them of an impending attack. 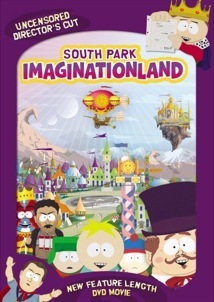 The boys, including Kyle, Eric, Stan (Parker), Kenny (Stone), Butters (Stone), and Timmy (Parker) are taken via hot air balloon to Imaginationland themselves by the mayor. But just as they get there, the terrorists attack, determined to break down the wall that separates all the good imaginary creatures from the evil ones. When the hapless Butters is left behind by the others, he must somehow help the happy characters fend off the nasty ones, while Stan needs to try to stop the military from nuking Imaginationland. At the same time, Cartman is determined to enforce his wager against Kyle. As usual, Parker and Stone offer satire of every imaginable political viewpoint, from the willingness of the military to destroy the imagination in order to save it, to Al Gore being presented as a delusional would-be superhero pursuing his nemesis, ManBearPig, in order to save the world, to the unremarked presence of Jesus as one of the denizens of Imaginationland. There's plenty of skewering of popular culture, especially in the Imaginationland sequences as various beloved characters are brutally murdered in a variety of grotesque ways by the forces of evil imagination. Parker and Stone's fondness for popular culture is also demonstrated, though most effectively on the side of evil as credible representations of various movie monsters wreak havoc. And haven't you ever wanted to see Popeye fight Darth Maul, or Santa Claus decapitate Captain Hook? The storyline of the bet is strung out a bit long, but it's undeniably hilarious as Cartman ends up foiling his own plans through his pride and desire to totally humiliate Kyle. Dressing variously as a king, sultan, and the pope, Cartman goes for the big degradation only to have it taken from him at every turn. It's lewd, disgusting, and hilarious throughout. The language is even more foul than usual, and is not bleeped. According to the commentary, some sequences are nastier than the version that was aired. Also back in the storyline are the memorable Christmas Woodland Critters. It's not clear whether this series will be included in the Season 11 set of discs, but for casual fans of the series, this is a must-buy. There are plenty of rude laughs and sharp satire at every turn, and it doesn't overstay its welcome. Image Transfer Review: Oddly enough, the program is presented in nonanamorphic widescreen. That seems to be an outlandish decision at this point in DVD's development. Along with that nonanmorphic transfer, there are some issues with serious combing throughout. Colors are nice and solid, helped along with the trademark visual style of the series. Audio Transfer Review: 5.1 and stereo English tracks are included. They're rather unremarkable, and the explosions are somewhat lacking in bass presence. The voices are fairly center-oriented but are quite clear throughout. Extras Review: The menu includes a clever prompt from Butters if you fail to pick an option. The main feature includes a commentary from Parker and Stone that, while not full-length, is at about 45 minutes and far more substantial than their usual mini-commentaries. There's a fun running gag about censorship of their comments, and they have some amusing if self-deprecating observations about their work. There are storyboards for two important scenes as well. The most essential extras are a pair of episodes, the thoroughly demented Woodland Critters Christmas (2004), which introduces the critters who play an important part in the last two parts of the trilogy, and ManBearPig, which introduces Al Gore's pet fascination. Since anyone buying this disc will most likely want to revisit the first appearances of these characters, it's awfully handy to have them at hand. If you haven't watched these episodes previously, it's highly recommended to do so before viewing the main program. The transfer has some shortcomings, but there's plenty of disgusting humor in this ambitious set of programs that fans will want to have. The inclusion of two bonus episodes is particularly welcome.